On Thursday, 1st March 2018, around noon-time, Israeli forces increased restrictions and collective punishment on the civilian Palestinian population in the old city of occupied al-Khalil. The increased restrictions were enforced in order to facilitate movement of settlers from the illegal settlements. This led to Palestinians being stuck and detained at checkpoints, including students and kindergarten children on their way home. The routine-high level restrictions of movement, collective punishment, intimidation and harassment of Palestinians are scaled up even further during Jewish holidays. These settlers were celebrating the Jewish holiday of Purim. 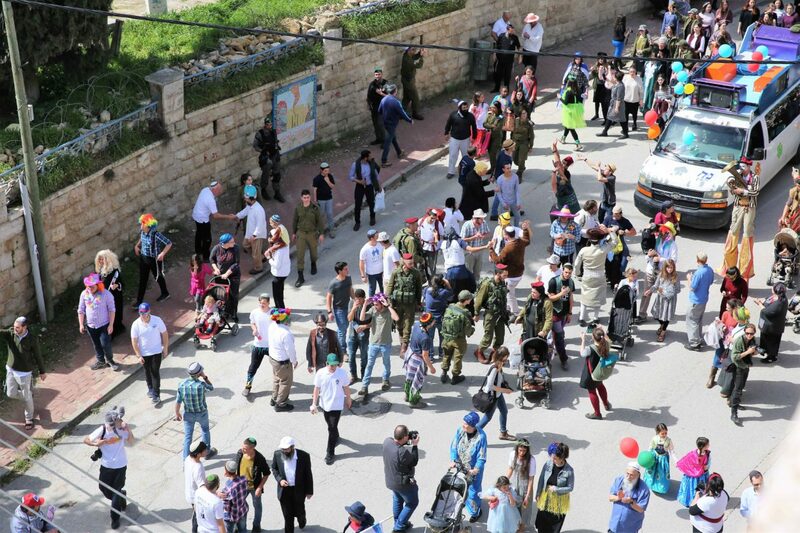 Many of them were wearing costumes, with some of them, including small children, dressed up as fully-armed Israeli soldiers. Others were dressed up as “Palestinians” wearing a kaffiyeh. As they paraded down Shuhada Street, this procession did not only impede Palestinian freedom of movement to facilitate settler movement, but additionally illustrated the apartheid-policies enforced by the army. Since 1994, Palestinians have been banned by the Israeli forces from accessing the vast majority of Shuhada Street solely and exclusively based on their ethnicity as Palestinians – a fact the Israelis furthermore deny in itself, referring to them as “Arabs”. The very few Palestinians still allowed to access the tiny strip of Shuhada Street that is accessible for Palestinians, have been assigned specific numbers as ‘residents’ which allows them to pass to their own homes. Any Palestinian not registered as a resident in the area, and thus without a number, is not even allowed to access this part of Shuhada Street by the Israeli forces. As Israeli settlers paraded from the settlement in the Palestinian neighborhood of Tel Rumeida, down Shuhada Street and towards the Ibrahimi mosque, Israeli forces shut down checkpoints. This was done in order to allow the settler parade to move freely, while denying Palestinians their right to go about their work and day. The checkpoints were closed for up to two hours. These checkpoints, many of which are fortified, are strategically placed to impede Palestinians freedom of movement. For Palestinians of all ages checkpoints are a daily obstacle on their way to school, work, home, medical facilities, or to simply visit family and friends and go about daily life. The arbitrary checkpoint closures are never announced, and Palestinians are completely stopped in their ability to move without prior warning. Students and teachers from Qurtuba school were detained on the stairs leading towards Shuhada Street (video credit: Human Rights Defenders), as they were trying to get home. Students and teachers at this school are only allowed to pass in the mornings on their way to school, and in the afternoon as they go home. Checkpoint 56 located on Shuhada street (one of the checkpoints leading to the Palestinian neighborhoods of Tel Rumeida) was closed for several hours (video credit: Human Rights Defenders). Similarly, at various checkpoints in the vicinity of the Ibrahimi Mosque, Israeli forces closed down and even locked checkpoints with padlocks, and stopped complete movement of Palestinians below the Mosque checkpoint (video credit: Human Rights Defenders). These measures were taken by the Israeli forces solely for the benefit of the illegal settlers to celebrate their holiday in a zone without any presence of the occupied Palestinian population. This is in clear contravention to the obligation of Israel as the occupying power to enable normal life for the occupied population. As stated in Article 43 of the Hague Regulation: “it is the duty of an occupying State to exercise their power for the benefit of the occupied area and population” (sources 1, 2, 3). In occupied al-Khalil, where the restrictions and harassment of the occupation are visible and palpable around the clock for the Palestinian population, Jewish holidays and events just add an additional layer of restrictions, intimidations, and harassments for Palestinians.